Did you ever feel that GATE is one of those exams that are very hard to pass? If you did, then it is you are in the wrong position. How so? You feel that GATE is hard and something that is very difficult to achieve because your preparations are not good enough. This article will help you realize how you were wrong about GATE being one of the toughest exams to pass and will also show you how to prepare well for the General Aptitude section so that you can score better. One of the better ways to start preparing for GATE is by joining for GATE coaching. To get information on the best places for GATE coaching, search online for the “best GATE coaching center in Calicut” or “best GATE coaching in Kochi” if your preferred location is either Calicut or Kochi. Now, first we’ll take a look at the GATE exam pattern for 2019. The duration of the exam will be for 3 hours. The total number of questions in the exam would be 65. The GATE exam will be for a total of 100 marks. There will be mainly two types of questions that will be asked: Multiple Choice Questions (MCQs) and Numerical Answer Type (NAT). The General Aptitude is a mandatory section. The General Aptitude for GATE exam contains 10 questions out of which, five questions will be of one mark each and the remaining five questions will be of two marks each. Hence, the General Aptitude section alone has a weightage of 15 marks. From the above, it is clear that the General Aptitude of GATE exam is unavoidable. But, if attempted carefully, it is also the easiest area where you can score too. In a General Aptitude for GATE exam, it mainly consist of two parts – Numerical ability and Verbal ability. Now, believe it or not, but this section is the most ignored section in every student’s GATE exam preparation. Why? It is because; most students who prepare and attempt the GATE exam would be those who are undergoing their graduation course. Hence, they would have already been through many aptitude questions while they were preparing for the campus recruitments. This gives students an over-confidence that they are well-versed with the aptitude questions. Checkout the GATE preparation tips. Now, the main challenge with aptitude a test (probably it is also the greatest challenge) is that there is no pre-defined course for it. This means that one can never be confident about covering all the areas for aptitude. Your preparations for aptitude should be a habit rather than something you practice for a few months or years. Also read the tips to crack the GATE exam in the first attempt. Aptitude is not something that can be learnt in a matter of a few days or months. It is one area that will teach you something new with every question you solve. Hence, it should be made a habit rather than a subject for the last-minute study. In order to prepare well and to make aptitude a habit, devote one hour each day for practicing aptitude questions. Even if it is 10 questions that you are able to do, it will certainly help. Do not give all the focus on learning the different methods involved in aptitude problems since each problem can be solved using a different method. Though the problems and the numbers might look like you would need a calculator to solve them, most of the time they do not. So, you should be real quick with your calculations. Learn and grasp all the shortcuts you can get and apply them. While you learn, if you are not able to figure out the solution for a problem, do not be eager to drop it quickly. Try the solution multiple times, each time from a different perspective. This would enhance your thinking ability and so will help you learn better. English movies and TV series can help you improve your vocabulary. But better sources are the English articles or newspapers. Read them while you travel or when you are free. That will help you effectively use up your time. Keep all of these points in mind and prepare well for your GATE exam. Always remember, your preparations for GATE should be a habit and not a last-minute study. The General Aptitude section is one where you can score easily if you concentrate well. The best way to kick-start your preparations for GATE is by attending a GATE coaching. If you are in search of one such institute in Calicut, then search online for gate coaching center in Calicut. There are several coaching centers in the place. Or, if you are looking for one in Kochi, then search Google for best gate coaching in Kochi. If GATE coaching classes in coaching centers or even those online coaching classes are something which you cannot accommodate into your daily schedule, then you can opt for GATE coaching guides. There are plenty of guides by different publications out there in the market. Get yourself one that best helps you understand the topics. Also read about GATE mock exam. Why do you need to attend a GATE coaching class? Or, do you need to attend a GATE coaching class at all? It is mentioned a couple of times within the article that it is best to take a GATE coaching from any of the GATE coaching centers nearby. If you were living in Kochi or Calicut, then finding a Gate coaching center in the locality is not a difficult task. All you need to do is search in Google for “GATE coaching center in Calicut” or “best GATE coaching in Kochi”. But this question might sure have popped up in your mind: do I need to take up a GATE coaching class? It is not a wrong question; rather, it is indeed one that you should be asking yourself. It is you who should analyze yourself and then decide on whether you need a GATE coaching or not. If you are confused, here are a few points to help you arrive at a decision. Did you understand all the topics thoroughly? How well did you perform in the university exams? Are you through with all your basics? If the answer to all of these is a “no” or “maybe”, then it is best you attended a GATE coaching. To all the final year college students, it is better if you took some online GATE coaching classes since all of you will be busy with the classes, assignments, exams, labs, etc. You would already have had exposure to aptitude for your campus placements. So, an online GATE coaching class should help you perform better. To the working class, since you have a job to keep and so won’t have much free time around, it is best you opt for an online coaching class. To all those who attempted the GATE exam once and failed, do not jump into a GATE coaching class directly. Of course, you could do so if you are sure that that is the only way to get your preparations for the next GATE exams started; i.e., you have not learnt your basics thoroughly. What was the main reason that you could not perform well? Were your GATE scores poor because you did not prepare well at all? Was it because of a few areas or subjects that you could not attempt? Or you made some silly mistakes? If after analyzing yourself thoroughly, you get the feeling that all you need to do is put in more effort, then go ahead with it; attend an online coaching class to help you through. GATE coaching classes reach out to you a helping hand to get you preparing for your exams. But the continuous and final preparations have to come from your end if you definitely want to pass the GATE exam. 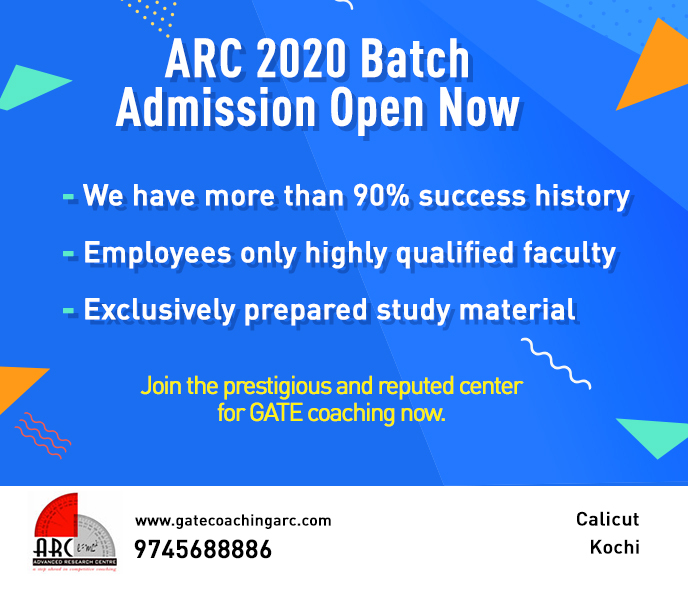 GATE coaching classes, be it the best GATE coaching center in Calicut, or the best GATE coaching in Kochi; wherever they be, they can help you lay down a strong foundation for your GATE exam preparations. Now, whichever path you would choose for your preparations for the GATE general aptitude exam, there is this one point that each of you must follow. The most significant point you have to keep in mind while preparing for your GATE exam is that success can only be achieved if your preparation process is an ongoing one; a preparation process which you have made a hobby rather than a last-minute study-it-all venture. So, work hard, practice and prepare well and most importantly, prepare to keep all the advice in mind and in action. Also Read about the GATE self study. Crack up the general aptitude section easily, earn the best score and be on your way to pursue your dream and so to achieve success in your life. ARC foundation is one of the best GATE Coaching centers in Kerala. 1000’s of students who enroll in our coaching center have successfully cracked the GATE and are into some of the best colleges in our country. If you are planning to take up GATE 2019? Lack an idea of how the examination will be? Contact us today and we will help you out.